Yesterday was a big day for Adirondack moose lovers. 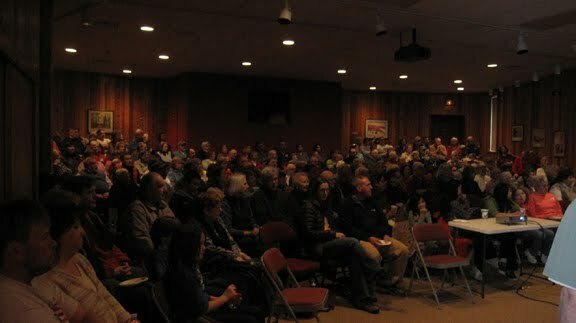 Nearly 200 fans of the majestic mammal squeezed themselves into the Adirondack Museum’s auditorium in Blue Mountain Lake, NY to hear the comeback story of Adirondack Alces alces. Ed Reed, resident biologist and NYS DEC’s famous moose whisperer, presented “Moose on the Loose in the Adirondacks" and explained moose were native to New York, but were extirpated before 1900. He then proceeded to mesmerize the audience with his explanation of the late 1980’s moose-wandering craze that swept from Maine and Canada across New England, and led to the recolonization of moose in the Adirondacks. Everyone in the room seemed pleased to hear the Adirondacks have a ‘breeding population’ of moose that is now well established and self-sustaining. It was also an interesting day for me. Naturally, I love watching Ed in his element, enjoying his work. Although, we have established that I might be a tad biased, he does a great job. 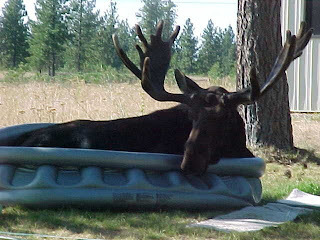 I also agree it is very cool to see moose in one’s backyard. The most interesting part of the day for me however, was the audience. It was amazing to see the diverse collection of people who came from all parts of the world and ended up in little Blue Mountain Lake. To put this in perspective for my out-of-the-Adirondack readers: we were the middle of nowhere. Blue Mountain Lake is a lovely Adirondack hamlet of approximately 146 people. The nearest large population center is 26 miles away in Tupper Lake, which boasts a population of around 3,800 people. In the crowd of moose aficionados were elderly people, young children, and all ages in between. There were people of all shapes, sizes, colors and ethnic backgrounds, mountain-men and women in their buffalo plaid woolens and boots, and dolled up city slickers who had left their second-home camps on the lakes for the event. Some people drove an hour and a half to attend the program. Everyone seemed to be a having a great time. Even Mr. Naturally Shy himself, Ed, was happy to talk. The museum official in charge finally had to stop the question and answer session and call it a day. Indeed, it was a perfect Adirondack day and another great example of this awesome Adirondack lifestyle. Below is one of my favorite photos from Ed's presentation. It shows how much moose enjoy and need to stay in the water when it is warm outside.